The healthcare industry conjures up images of doctors, nurses, and clinical staff dashing through hospital corridors. However, there is a whole other subsect of healthcare workers that cater to the outpatient population. In order to do their jobs, these home healthcare workers – e.g., registered nurses, physical therapists, infusion and respiratory care specialists – must drive to patients’ homes to administer specific outpatient services, such as shots, delivering oxygen tanks, hospice care, etc. 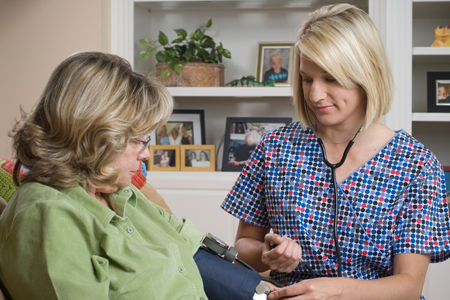 It is important to distinguish that home healthcare workers are not employed by hospitals. Rather, they work for separate home healthcare companies that hospitals hire to provide critical outpatient services. Because of this, there are certain insurance-related financial pressures that these companies need to account for to remain profitable. In some cases, patients need added care after being discharged from the hospital – e.g., they are recovering from a broken leg and need a physical therapist to help them rehab from the comfort of their own home. This is where the home healthcare company steps in to provide this service to both the hospital and patients. But the way insurance works in this scenario (and others like it), and how it impacts the home healthcare company’s overall costs (and income), is complicated. For example, insurance pays for a patient’s first hospital visit and for one visit from the home healthcare company post-op. But, because insurance companies look to maximize the value for every dollar they spend, they won’t cover the rehab cost of a second visit if the patient ends up back in the hospital within 30 days due to the same injury. This puts home healthcare companies in a tough spot since readmission causes reduced payments and penalties, creating further cost pressures. Moreover, home healthcare companies also have to consider the type of insurance they are working with when it comes to payouts. Government provided single-payer insurance programs (like Medicaid) typically pay more for a patient’s rehab than an employer-provided insurance company will. Because home healthcare companies are hyper-focused on revenue and cost control, this insurance payout difference is important when it comes to setting their workers’ salaries and benefits, and especially when it comes to reimbursing their workers properly for the business mileage they drive to and from patients’ homes. Home healthcare workers typically drive their own personal vehicles to and from patient homes to administer their services. Because they are driving their personally-owned vehicles, it is the home healthcare company’s responsibility to reimburse their workers for the costs associated with driving for work as mandated by different state labor regulations (such as California’s Labor Code Section 2802(a)). Like many businesses, home healthcare companies use the popular Internal Revenue Service (IRS) business mileage standard to reimburse workers for the work-related miles driven on their personal vehicles. Unlike many businesses, however, home healthcare companies don’t pay the full standard, which for 2018 is 54.5 cents per mile. Instead, they pay below the standard at anywhere between 25-40 cents per mile. There’s nothing inherently illegal about this, but it can land home healthcare companies in hot water should their workers sue based on labor regulations for the business miles they are rightfully owed (see RadioShack, Starbucks, and Uber as examples). The variances in insurance payouts and the potential for costly lawsuits because of inaccurate reimbursements should be more than enough to prompt budget-minded home healthcare companies to search for solutions that keep the overhead costs of doing business down. But surprisingly, it’s not. When compared to other industries, home healthcare is vastly behind the curve when it comes to utilizing tech-enabled business solutions. This is mainly because those making the decisions are “fearful” of the technology since they may not be adept at using it. When it comes to vehicle program technologies it becomes even more concerning since most of the home healthcare market is mileage reimbursement related. Outdated methods of doing business – e.g., manual reporting, paper receipts, etc. – force healthcare companies to overspend about 20 percent on mileage reimbursements since paper calculations account for what is “reported” versus using technology to capture actual mileage in real-time. The same technology can be found in any car. GPS-enabled smart devices, mobile apps, and cutting-edge software allow employees to eliminate manual tasks in the field and automate business mileage tracking. This ensures that the proper miles are tracked, collected, and stored for a more accurate reimbursement payout. It also can be correctly reported to the IRS without creating mountains of paperwork. Further, with today’s unemployment rate down around 4 percent, companies also lose valuable talent to the competition who embraces technology. For example, potential new hires will be more inclined to work for Company A that reimburses its workers $800/month to drive their own cars over Company B who miscalculates costs and under-reimburses its workers just $400/month for the same service. From a purely operational stand-point, home healthcare companies also stand to gain a lot from the back-end analytics that technology produces. For example, the data gleaned from GPS and mobile devices allows companies to see which visits take the most time for workers or which require more attention. All this analysis enables companies to make better business decisions to maximize their workers’ time. For an industry where decision makers are hyper-focused on balancing insurance payouts, operational costs, and employee reimbursements, there is no excuse to dismiss technology’s potential to radically increase efficiencies. As the number of outpatient visits increase, home healthcare companies are best served to invest in the technologies that make reimbursement for their workers fair and accurate across business spend. Arthur Tsakonas is Senior Regional Sales Executive for Motus.